A product roadmap is product management document whose purpose is to show the strategy of the product, in terms of the goals meant to be achieved over time. 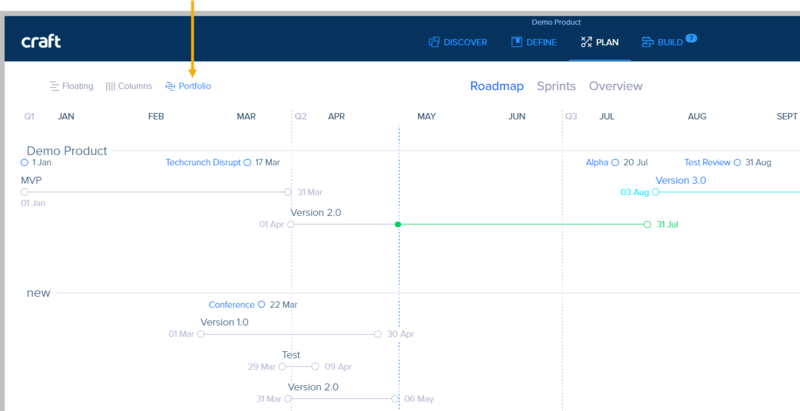 The roadmap is built of release *Versions, that contain the goals, initiatives and the relevant stories, and **Milestones for your business plan. It is not intended for displaying development features or bugs, but more to show the high-level aspects of the product to involved teams and members. * To add a Version to the Roadmap, click here. ** To add a Milestone to the Roadmap click here. 1. Click the Plan Tab. Version - Displays the various versions of your product development. You can click the version in order to edit it. To learn how to add and manage versions, click here. Milestone - Displays the various milestones of your product development. You can click the milestone in order to edit it. To learn how to add and manage milestones, click here. 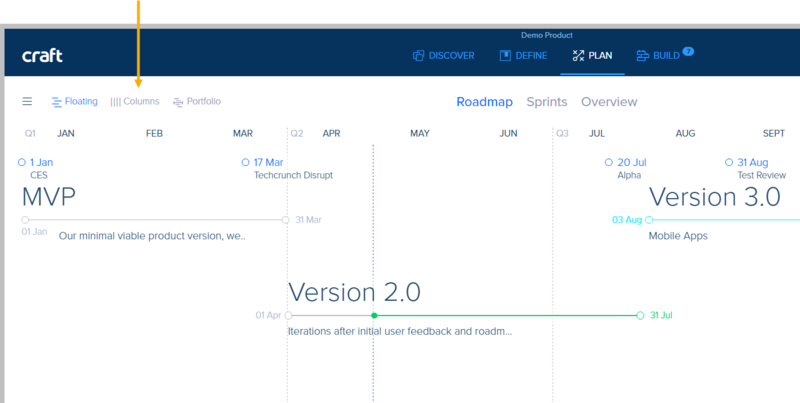 Current Date - The current date is the dashed horizontal line that displays where you currently are in your product plan. Note: You can click a version or milestone at any time and edit its details. Year Selection - This allows you to browse to the year before or year after the current year, so that you can see the past and/or future sections of your plan. Year/Quarter/Month Filter - This allows you to toggle the view of the roadmap so that you can obtain a yearly, quarterly or monthly perspective. Views - This allows you to toggle the view of the roadmap so that you can obtain a Portfolio View, Floating View or Columns View. Portfolio View - This view allows you to see a plan of multiple products on a single timeline and therefore, will allow you to have all of your versions and milestones available in a single view. To add Products to the Portfolio View, click Add Products. Floating View - this is the default view, which displays the breakdown of your currently selected product versions and milestones on a yearly scale. Columns View - this view displays all of the planned versions and milestones along with the Essentials, Themes, Epics and User Stories that are assigned to the specific Version, in an easy side-by-side comparison.